When you think of Giantex, the first thing that might come to mind is portable washing machines. However, some of the best companies are those that can branch out into other areas, and Giantex has managed to do that with its brand of ice chests. These coolers are designed to carry different loads of drinks and food, depending on how much you need to bring with you to the party. Features are included to make sure that items are secure and the ice stays cold, and different sizes are available in case you’re the only one around to carry the cooler or have a huge event to go to. If you want to learn more about these offerings and have an event coming up that requires the inclusion of drinks and food, read on in this Giantex Cooler review to see which ice chest best suits you. Making sure that you’re items are kept safe in your cooler is a priority for whatever ice chest you pick, and you’ll be happy to know that Giantex ensures protection with construction that is designed to handle the worst of weather conditions. That way, the drinks and food that you carry will be safe and sound if it’s raining or snowing, as well as whether you’re walking on grass or gravel. 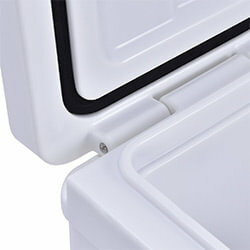 Two locking latches are included to add extra security to keep your items inside in case you end up dropping the cooler if it gets too heavy after a while or you step on a pebble and lose your grip. In case you’re carrying the ice chest during a rainy day or to an area like a beach or campsite that can get it easily dirty, the outside of the coolers are smooth to make sure that you have an easy time cleaning them when you bring them back home. The sun can be a problem if it’s hot enough to make the cooler warm, especially if you want to avoid providing warm drinks to everyone at the barbeque. In case there aren’t clouds hanging out to provide assistance in keeping your drinks cool, Giantex added LLDPE and PU FOAM material so that the sun’s rays don’t stop you from enjoying some cold beer and soda. Cooler lovers are usually concerned about their ice chests having the right amount of insulation to make sure that their drinks and food stay cold, and Giantex’s ability to keep drinks in prime condition is among the praises that its options have received. These coolers come with 1.75 inches of commercial PermaFrost Insulation, which may not make it the best choice for a place to keep items over the span of a week or longer. Hunters and fishermen looking for an ice chest to keep their game cold for a long span of time may want to stick with other options like Icehole Cooler or Grizzly, but those who just plan on going away for a weekend with friends or family will be perfect for this brand. The extra thick FatWall design acts as insurance in case you weren’t convinced enough of the quality of Giantex’s insulation. One complaint that users have pointed out in reviews is the lack of rope handles on the 40QT, 32QT and 20QT versions, which can be a big problem if the cooler you’re carrying is heavy or a small one that contains a large portion of items inside. 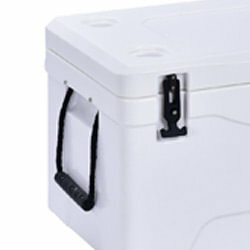 However, rest assured that Giantex thought to add the handles to the 64QT cooler, which is a smart move considering its size compared to the other options. Luckily, the smaller alternatives are light enough so that you can carry them around the top on your own, as long as you’re not bringing too much. Carrying a cooler loaded with drinks and food from your car to the backyard of your friend’s house can be a hassle in its own right. It doesn’t make it easier to have an ice chest at the end of the party that’s full of water that can stain the trunk of your car and could make your floor wet when you take it back inside your house. 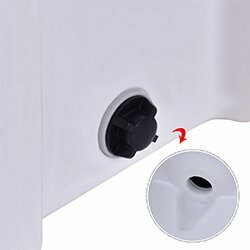 Thanks to the Giantex coolers’ drain plug, you can get rid of the excess water right when you and your group are done downing beer to ensure that you have a dry car and home. Giantex was smart enough to offer a variety of sizes for its coolers depending on how much you’re bringing or what kind of party you’re going to. The 64QT version currently stands as your largest option with an outer dimension of 28 in. X 16.1 in. X 17.1 in. and an inner dimension of 24.41 in. X 11.81 in. X 12 in. This makes the 64QT ice chest perfect for your best friend’s birthday party or a family member’s graduation celebration. If you plan to carry lighter, for perhaps a night where you and your buddies are watching a game or you’re making a quick visit to a relative that you haven’t seen in a while, you should stick with the 20QT size at 20 in. X 13 in. X 15 in. 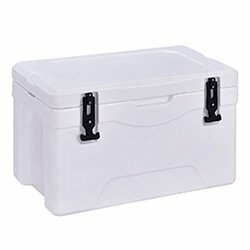 or 32QT cooler, which measures 21.5 in. X 12.5 in. X 13.5 in. on the outside and 17 in. X 8.7 in. X 9.2 in. on the inside. The 40QT option will also provide a relatively easy carry at 23.8 in. X 13.1 in. X 14.8 in. on the outside and 19.29 in. X 9.44 in. X 10.63 in. on the inside. As satisfying as the options mentioned above are in ensuring nice, cold drinks to enjoy, you’ll be happy to know that Giantex has plenty of alternatives if you’re looking for something different. 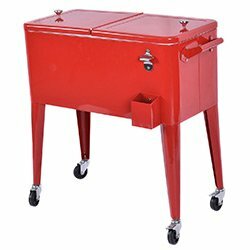 If you’re looking for an alternative that gets rid of the need to carry anything, the 80 Quart Cooler Cart is available so that all you have to do is push your drinks to the area with the rest of the ice chests. As featured in our patio coolers guide before, this choice is designed to keep your drinks cool for up to 72 hours, and the insulation should add as a backup in case it’s too hot and sunny. Having four wheels makes the cart easier to move, especially if you’re pushing it outside, and two top lids are added so that you can take drinks out of both sides. Taking drinks out is also made simple with the easy-fill lift off top, and just because this isn’t a typical cooler doesn’t mean it doesn’t come with a drain plug, which is simple to assemble, can be twisted off, and makes for a drier experience. The cart is red (there is also brown rattan version), separating it from the silver and grey coolers that Giantex has to offer and may grab attention from what others bring to your party. 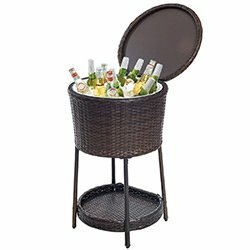 Giantex doesn’t stop with a cart in regards to variety in its cooler options, as the Rattan Ice Bucket Cooler is available if you’re looking for a slightly lighter ice chest to carry. This option is designed to be compact so that whatever you’re carrying is stiff and snug inside, and it’s stylish enough to where it can act as a display in your house if you’re having people come over and the guests will be the ones that will provide the drinks. The cooler is also durable and sturdy because Giantex made it out of iron and rattan, so you don’t have to worry about it falling over in case someone bumps into it or your cat jumps on it while exploring the living room. The top basket allows you to store a good portion of drinks with ice, and the cooler is easy to carry, weighing 19.14 pounds and measuring 19.3 in. X 18.9 in. X 30.9 in. It’s one thing to have a cooler that does a great job of keeping your drinks cold, but it’s another thing to have a cooler that makes your party-going experience even more convenient. In comes Giantex’s Multi-Function Rolling Cooler, which not only serves to make sure your beer and soda stay cool but also acts as a table for picnics and lunches. 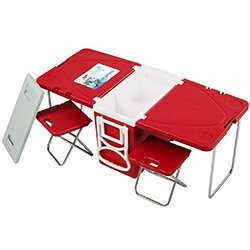 This option comes with attachable tables to put together for your kids’ meals while you and your friends enjoy food and drinks at the adults’ table, and chairs are included so that you can save money and avoid having to look for extra chairs for your kids. Anyone looking for inexpensive coolers will be happy to know that Giantex is the perfect fit. 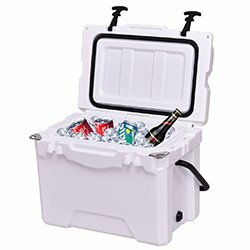 The most expensive option will be the 64QT ice chest at $149.99, which will still save you a large load compared to Icehole, Yeti, nICE and other brands. The prices go down from there, with the 80 Quart Cooler Cart at $109.99 at the time of writing this article, the 40QT option at $199.99 and the 32QT cooler at $99.99. In addition to having the easiest time carrying your ice chest, you’ll be able to save the most money with the $74.99 Ratten Ice Bucket Cooler and the $59.99 Giantex’s Multi-Function Rolling Cooler. Online retailers serve as the new spot for buying items, as much as they vary. This includes coolers, and Amazon is currently our favorite spot to buy Giantex’s offerings. There are lots of them on sale there. The extra parts to ensure safe carriage and usage are typically included at the prices mentioned above. 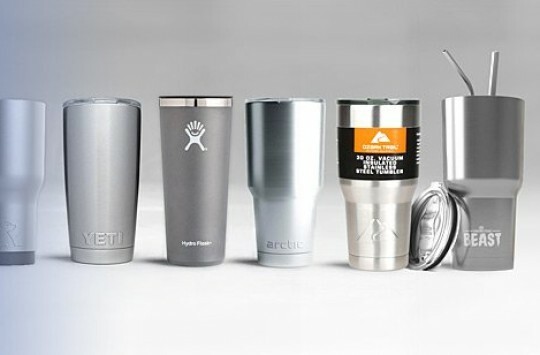 It’s fortunate enough to have coolers available that are cheaper compared to more popular brands, but Giantex takes that to a new level with its offerings that ensure cool drinks and extra usage. This company will provide ice chests that act as displays and tables in case you want to stand out from the rest of the crowd. If you weren’t sure about getting a Giantex cooler before, you should be now. Giantex’s Multi-Function Rolling Cooler Featured at the Rachael Ray Show! Magna Cool Magnetic Cooler - It Does Have Magnets! Awesome, Right? 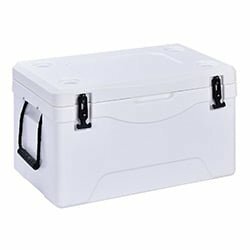 Calcutta Cooler Review - Can These Ice Chests Keep their Cool?